Regardless of the time of year, one-dish meals are always in season and priceless. Modeled after a dish I used to make all the time in college, Southwest Chicken Casserole is one of my favorites! 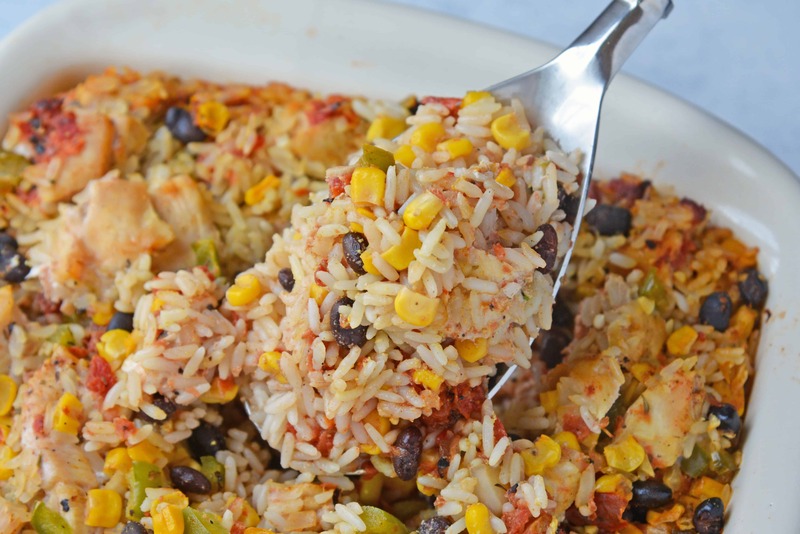 Southwest Chicken Casserole is an easy one-dish meal using chicken, rice, black beans, tomato, corn and southwest spices. One-dish recipes save time on the front end during preparation and the on the tail end for clean-up. 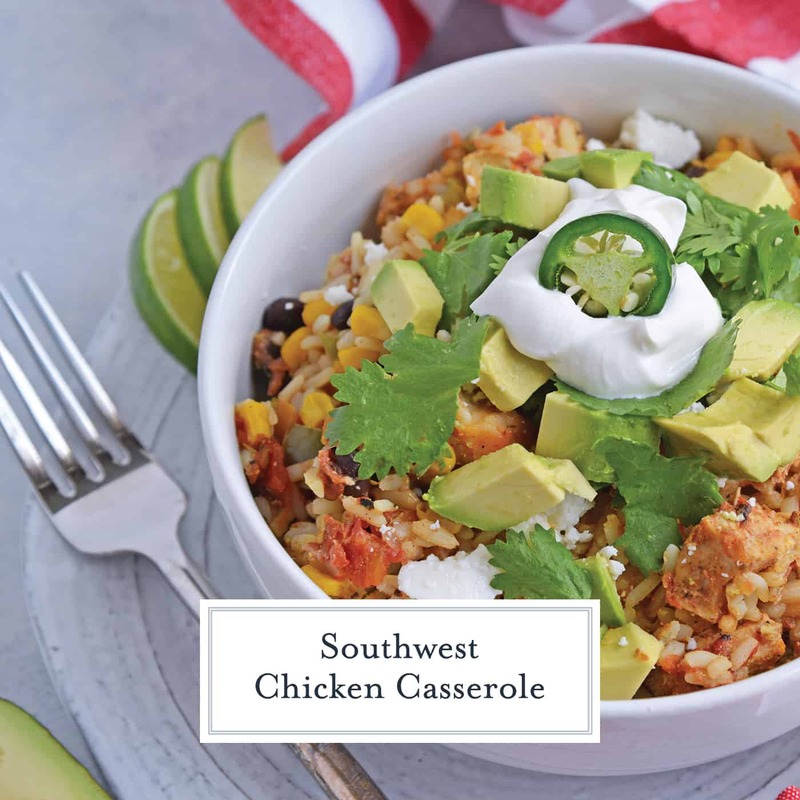 Southwest Chicken Casserole is not only a simple one-dish meal, it is also fairly healthy. 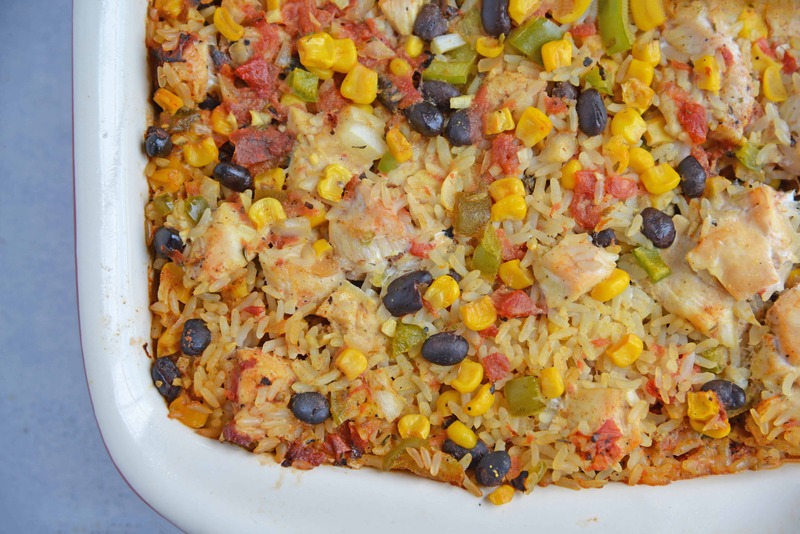 Make sure you PIN Southwest Chicken Casserole! 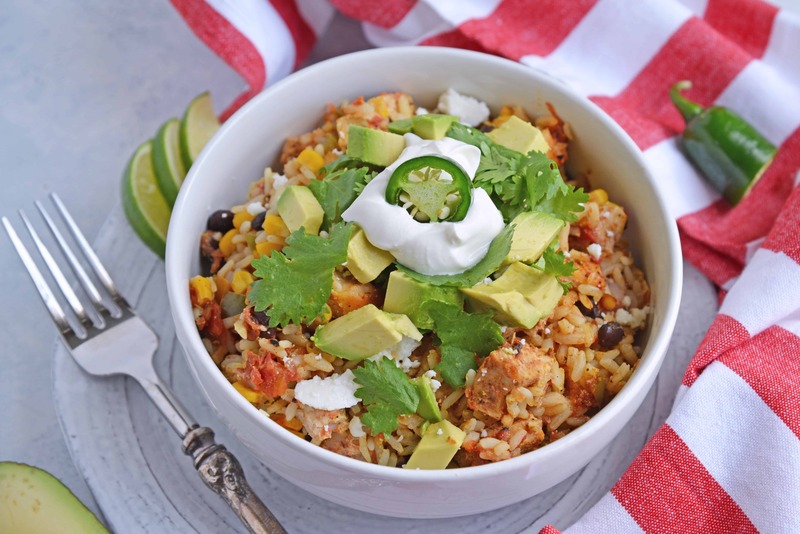 Using brown rice, vegetables and fiber rich beans adds color, texture and flavor. 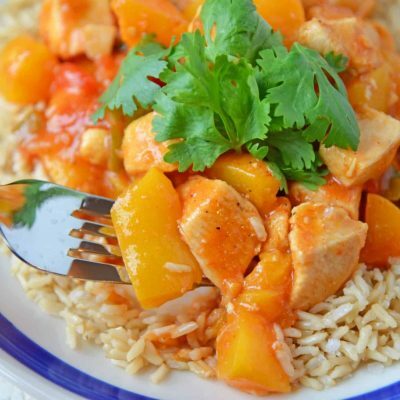 Southwest spices are full of antioxidants and flavor. There is also some evidence that suggests spicy and smoky flavors may help increase metabolism for an hour after being eaten. I developed Southwest Chicken Casserole after craving a dish I used to make when I was in graduate school. 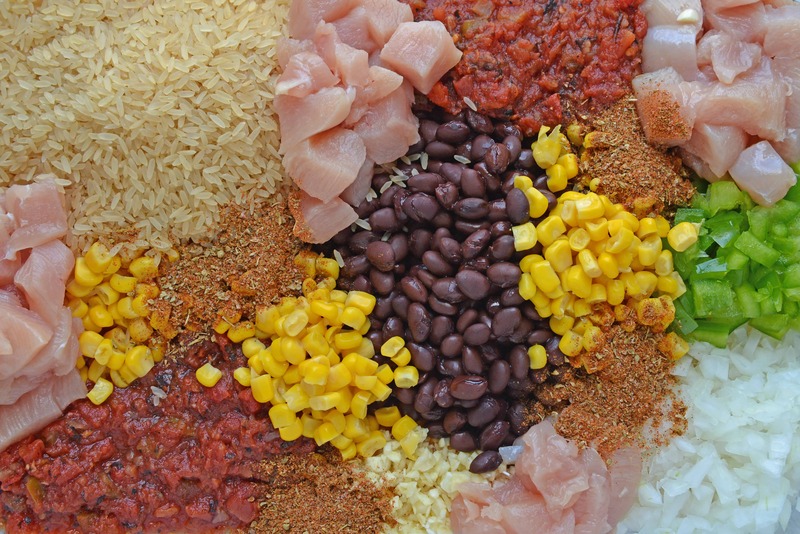 It was a premade seasoning packet that only required the addition of canned tomatoes, beans, chicken and corn. It was basically a shake and bake, coming with an oven bag. I realized it was no longer on the market and I’d need to develop my own version. 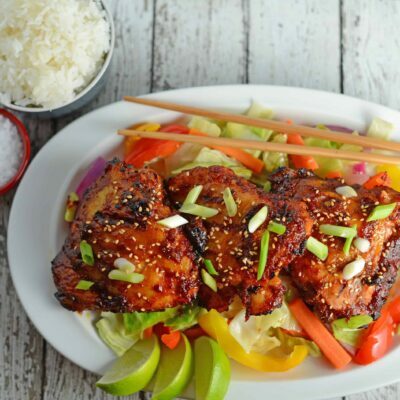 It was actually quite simple and gave me the flexibility to add even more flavor and reduce the sodium. Win-win. Did you know that rinsing canned vegetables can reduce the sodium by up to 90%? I rinse the beans and corns, but keep all of the flavorful juices from the tomatoes and zesty green chiles. These liquids soak into the brown rice, which can be bland and usually requires additional salt. Also, making your own southwest seasoning with dried herbs you most likely already have at home, saves money and allows you to adjust the salt content to your own preferences. Sealing the baking dish tight with aluminum foil creates the same type of steaming as you would get with rice in a saucepan, trapping the moisture in and keeping the chicken moist. 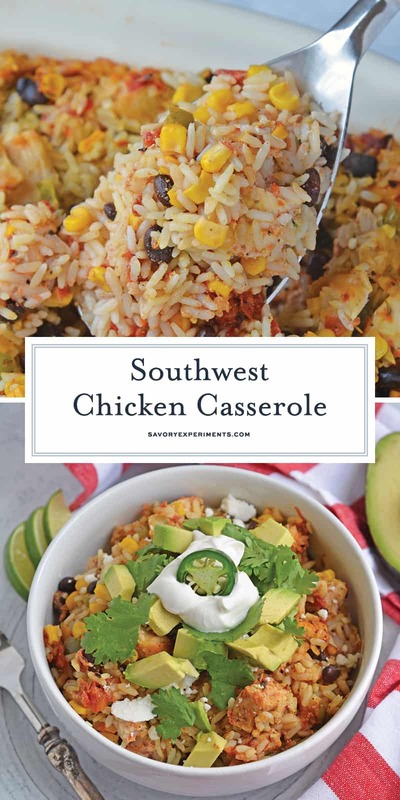 I was making Southwest Chicken Casserole as meal prep for the week before meal prep recipes were even cool! One batch accounted for an entire week of lunch or dinner. Preheat oven to 350 degrees and coat a 9x13 baking dish with cooking spray. 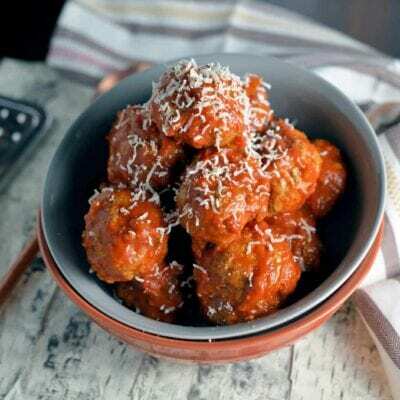 In a small bowl, combine chili powder through dried oregano, stir and set aside. 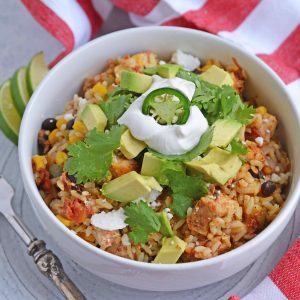 In a large bowl, combine rice through black beans. Stir to combine and then add spice blend, stirring to combine again. Line the bottom of the baking dish with chicken strips in a single layer. Pour rice and vegetable mixture over chicken. It is important to place the chicken on the bottom against the baking dish and near the heating element of the oven to make sure it is cooked all the way through. Cover with aluminum foil, tightly sealing around the edges to create a steamer for rice. Bake, covered, for 50 minutes. 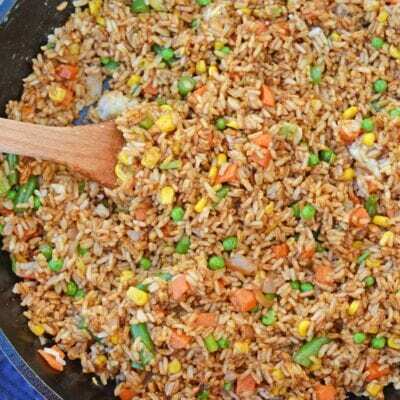 Remove, uncover and fluff rice with a fork before returning to the oven for an additional 10 minutes. Remove and serve. Top with avocado, sour cream and Mexican cheese blend, if desired. 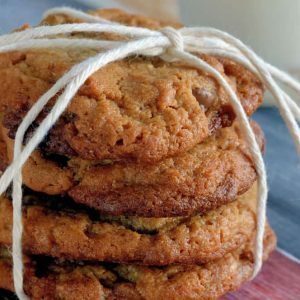 This looks wonderfully delicious Jessica and thanks for supporting the Say G’day party! All of your submissions have been pinned! This looks fantastic! 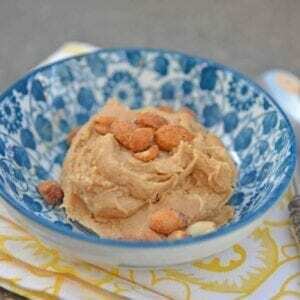 I bet this is perfect for summer! So vibrant and colorful, delicious!